Showing up dead has a pretty negative connotation. People will sometimes claim that the dead are lacking energy. We get why you'd think that. Graveyards are pretty quiet, unlively zones. But here's the thing, the dead can be pretty darn elegant. Just look at the amazing skeleton characters you can see on Day of the Dead festivities. With flowers intertwined in clothing, sugar skulls painted with care, and elegant illusions to Catholic saints these skeletons break the mold. They get to sleep the whole year away. So when it comes to "their day" the dead are going to head onto the streets in wild, colorful style. There's no holding back when it comes to color and culture. Afterall, you only after live once. 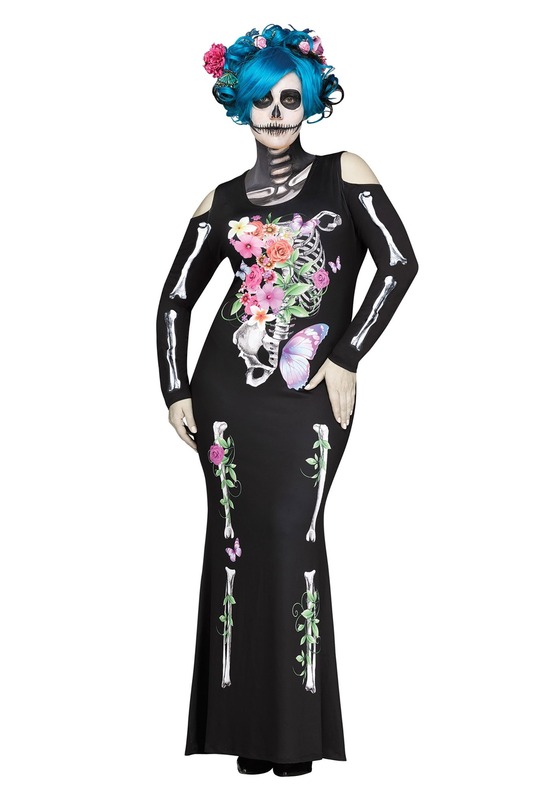 This elegant black dress with a cold shoulder cutout will make your Day of the Dead look stand out with both macabre bones and a floral print throughout the look. Vines climb the leg bones and are intertwined with the printed rib cage. The pelvic bone is finished off with a butterfly wing. This long, fitted dress that will make you feel like a Day of the Dead star when it's paired with sugar skull makeup. Dressing up as the luxurious dead is the elegant answer for both Halloween and Day of the Dead. Perfect for both workday costumes and evening wear, you'll feel timeless and macabre in the floor-length dress. Want to make it a group costume? You'll have plenty of choices to dress up the whole family in Day of the Dead looks. Maybe you're heading out for a parade or perhaps you're simply dressing up for a costume party. Either way, you'll be glad you chose such an elegant look to show up dead on arrival!